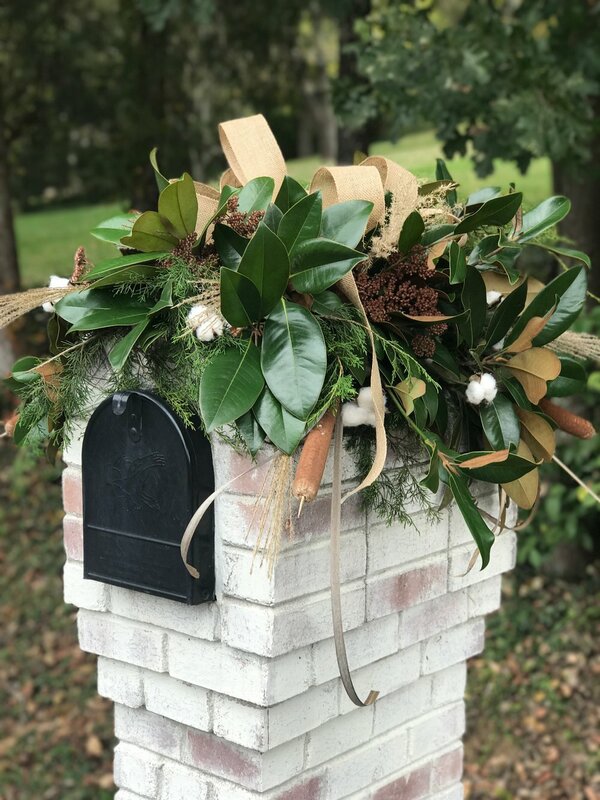 WE DECORATE MAILBOXES WITH THE FRESHEST CLIPPINGS OF MAGNOLIA, EVERGREEN, CEDAR AND BERRIES. Decorated with the freshest clippings of magnolia, evergreen, cedar, and berries. Each mailbox is custom-made on site and, just like in nature, no two are exactly alike. Your choice of ribbon is included. Custom ribbon is available upon request. Fee based on choice. Custom Mailbox: email for quote downtothewire.nashville@gmail.com. Fall mailboxes provide an excellent opportunity to use the bright and beautiful colors and textures of the season.